A new teaser has appeared! 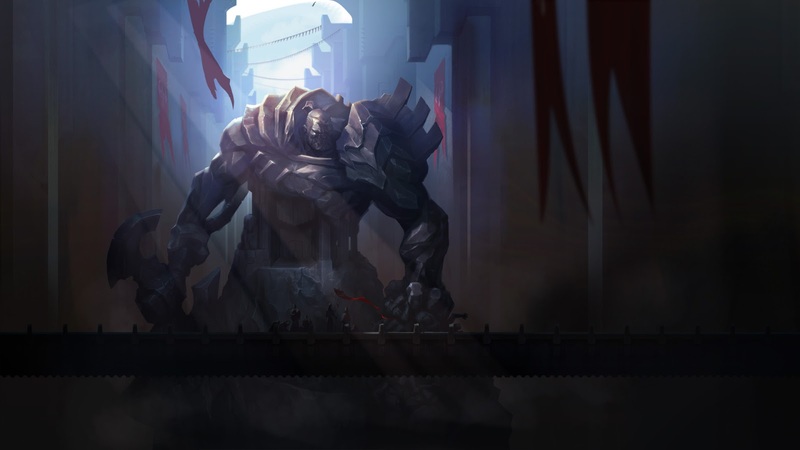 Titled "Reborn", the promo page showcases a massive statute paying Tribute to an unnamed Noxian warrior who "would never be denied victory, even by death." Today's entry is GLORY. "Though our greatest champion has fallen, let this monument stand in his memory. Let it remind us what it is to be Noxian. Let it remind the world that we will never lay down our arms, and that if we do ever fall, we will fall gloriously." In this world, nothing is given, only taken by those with the power and the will to do so. Today, we honor a man who embodied what it is to be Noxian, a man who would never be denied victory, even by death. I remember clearly the day he died. Our hated enemy had marched on us in force. They stood at our walls, ten soldiers fielded for every one of our own, their craven king hiding behind his army to witness us scoured from the face of Valoran with his own eyes. While others counseled me to bar the gates and force our foes to fight for every inch of Noxian soil, this man demanded we march out and face them. He would not cower behind the city walls while Noxus's enemies still drew breath. With our warriors at his back, he strode as a giant through the Demacian rabble with one clear purpose: to cut their army's head from its body. Jarvan's royal guardsmen believed they could halt his charge. They were wrong. He cut them down, one by one, until only he and the king remained. Battered and fatigued, any lesser man would have given up the attack, but he was a true son of Noxus. He battled Jarvan beyond the point of breaking and was finally bested… but not beaten. With his dying breath, he locked his fingers around the king's throat and broke the will of a nation. Every Noxian should look upon this memorial and know this is what I demand of you: If you die, do so gloriously. Make the world falter at your loss. The Grand General puts on a brave face, but he takes this loss harder than he lets on. With his most trusted supporter dead, he feels the treacherous eyes of his generals on his back. A successor must be chosen. Demacia's shaken. We can't squander this opportunity! Darkwill sees assassins in every shadow; he is paralyzed by fear. No. He is stalling. Darkwill did not become the Grand General by being a coward. Find out why. Darkwill's thralls are searching for something. Snatching up articles of the arcane: rituals of blood and bone, relics of the Shadow Isles, and things darker still. He desires things we can offer. An interesting opportunity. I will bend his ear. If he is receptive, ensure we can provide what we promise. 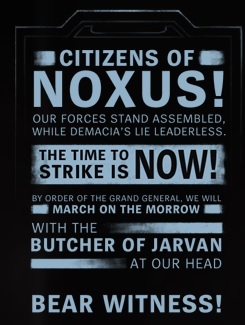 CITIZENS OF NOXUS! OUR FORCES STAND ASSEMBLED. WHILE DEMACIA'S LIE LEADERLESS. THE TIME TO STRIKE IS NOW! BY THE ORDER OF THE GRAND GENERAL, WE WILL MARCH ON THE MORROW. WITH THE BUTCHER OF JARVAN AT OUR HEAD. BEAR WITNESS! The promo page also has a bar at the bottom denoting GLORY and three more locked entries. If you dig a bit in the promo page, you'll find the names of the other pages listed as FALL, RISE, and REBORN.